What Virtual Sports Can I Bet on At Bet365 Sport? A recent report into the financial health of the betting industry in the UK revealed a surprising statistic. While betting on soccer and horseracing remained the most popular types of bets made at sports betting sites, which is no surprise at all given how much each generates for a typical sports betting site, what was stunning was that in third place behind the two betting behemoths in terms of revenue generates, was Virtual Sports. That means that other sports, such as golf, tennis, basketball, rugby are all, on average, not generating as much income for a sports betting site as their Virtual Sports operations. That’s a staggering statistic when you consider that Virtual Sports betting is still in its infancy and that we have only glimpsed the merest slice of what Virtual Sports betting could well offer customers in the future, once it has been enhanced and developed over a number of years, on ever-improving technology. If that is a sobering thought and has made you wonder what Virtual Sports has to offer that makes it so attractive to punters, then look no further than bet365 Sport. As when you sign up (and you can sign up today with the newest bet365 Sport New Player Bonus promotion by following the link), you can take full advantage of bet365’s excellent Virtual Sports service. What Virtual Sports does bet365 Sports offer? Bet365 carries a number of different Virtual Sports. We have gone through each one below and outlined how it is set up on the site, together with the different kinds of bets you are likely to find available for each Virtual Sport. There is a choice of Virtual Horseraces at bet365 Sport. You can view races at either Britannia Way, Festival Downs or Victoria Park and each of the start times for each race is staggered so that one race begins every 60 seconds. A typical Virtual Horserace takes around three minutes to complete in full, from opening the betting to the end of the race. Thus, by having the start times of the races staggered, this means you can bet on even more Virtual Horseracing events at bet365 than with other betting sites that offer just one race. The number of runners in a race is variable and can be between 7 and 14. The more runners in a race then the greater difference in odds you are likely to find between the favourites for the race and the outside bets. Races are run both over flat courses and over jumps and you can place a number of bets on Virtual Horseracing including standard Win and Each Way betting, multiple selection bets (such as accumulators) and Forecast and Tricast bets. Each race also has its own racecard generated which shows information about each of the runners including the jockey, the jockey’s silks colours, the name of the horse and of course, its odds. 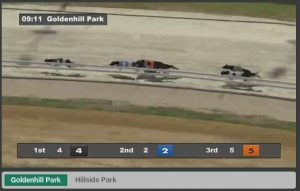 There are two Virtual Greyhound tracks to pick from Goldenhill Park and Hillside Park and races can be contested over the flat and also hurdles. A greyhound race starts roughly every 1 minute and 30 second at bet365 Sport. As in real life greyhound racing, there are six runners in each race and these wear vests that correspond to the vests used in real life greyhound racing, red, blue, white, black, orange and black and white stripes. You can make exactly the same type of bets on Virtual Greyhound racing as you can Virtual Horseracing. Virtual Soccer comprises of matches from two club competitions (Premiership and Superleague) and one international (World Cup) and you can select which set of games you want to watch. Kick off times are staggered so a Virtual Soccer game kicks off every minute at bet365 Sport. 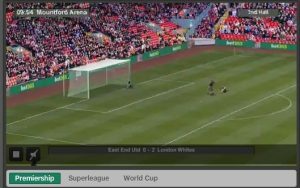 Matches are randomly generated and are not placed in the context of any event or tournament and the highlights package for each game will show the key events from the match including goals, missed chances, saves, penalties and similar. I have grouped these four Virtual Sports together as they tend to offer a very similar betting experience to one another, with just a few cosmetic changes based on the sport and the number of competitors altering the experience when you come to the sport. In Virtual Motor Racing you have 12 drivers competing, in Virtual Speedway it is just four riders, in Virtual Trotting it is eight competing, while in Virtual Cycling there are seven competitors in the race. 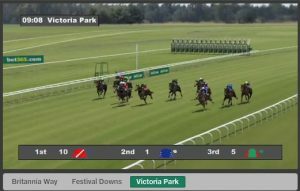 Each race starts with a period of betting and you can bet on pretty much the same bets as you can for Virtual horseracing or greyhounds, apart from in Virtual Speedway, there is no Tricast option (due to their being just four riders in the race). In Trotting and Motor Racing the race is decided over one lap of the track, but in Speedway because it is a shorter circuit, the race is battled out over two laps and for cycling the winner is decided after three laps. 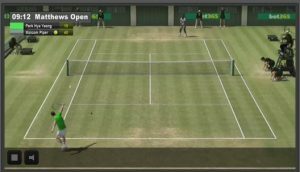 Bet365 is one of the few companies offering a Virtual Tennis service and in this Virtual Sport you can bet on which of the two players competing in the Matthews Open (a grass court championship) will win the match. Each match is contested over one game of tennis. 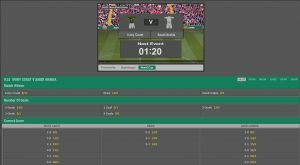 Once of the nicest aspects of bet365 Virtual Sports service is that each comes with a great highlights package that has been excellently animated. 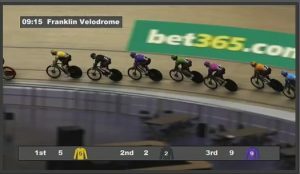 The realism in some, particularly Speedway and Cycling, is of such quality that you could be forgiven for thinking you were watching a real sport. Alongside the animations for each Virtual Sport, there is also a basic commentary, although the use of real-life TV commentators on Virtual Soccer in particular does add a degree of realism to the experience. With so many Virtual Sports to pick from, it is easy to see why bet365 Sport is so popular with the many punters eager to give this new form of betting a try.